* Take part in a draw for free internet rental between 21/12/18 and 02/01/19, with dates of stay between 6 April 2019 and 6 May 2019. Enter in the remarks of the stay during your reservation: Offer Christmas 2018. Offer cumulated with the early booking from -15% to -40%. * Early Booking Offer up to 40% off for all bookings before 31/01/2018 of a stay in 2019 of 7 nights minimum. 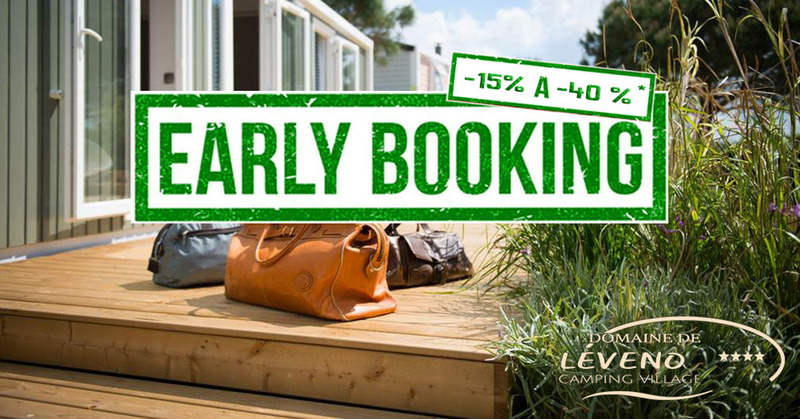 Offer reserved for individual customers, applicable on the public rate in force on the day of booking and on the club campsite Domaine de Léveno, within the limits of available stocks. Offer subject to conditions not cumulative except with internet privilege and offers Christmas. Reduction on all rentals of mobile homes and chalets to enjoy a camping in Loire-Atlantique cheap and avoid waiting for promotions last minutes uncertain. Book before 31/01/2019 and enjoy a 15% discount on all mobile home rentals and camping chalets. 15% discount on your second rental week for a stay of 2 weeks in a row. Discount applied on the least expensive week before 06/07 and after 31/08. 5% discount on the second week (cottage 6 places 2 and 3 rooms) in a campsite different from the group. 7 = 6 and 14 = 11 (7 nights on the campsite = 6 nights charged). Valid for any stay in camping location in April, May, June and September. The presence of the tenant is mandatory, the nights must be consecutive. Looking for location for the week ? 10% discount on your rental of 4 nights from Monday 16h to Friday 10h during the months of April, May and June (excluding school holidays). 50% discount on booking fees by booking on the campsite’s website (12.50 € instead of 25 €). Valid only on bookings made on this website. These privileges are not combinable with each other, nor with any other promotion or discount except the Internet privilege and offers Christmas 2018. Valid on stays of 7 nights minimum off mid-week offer.